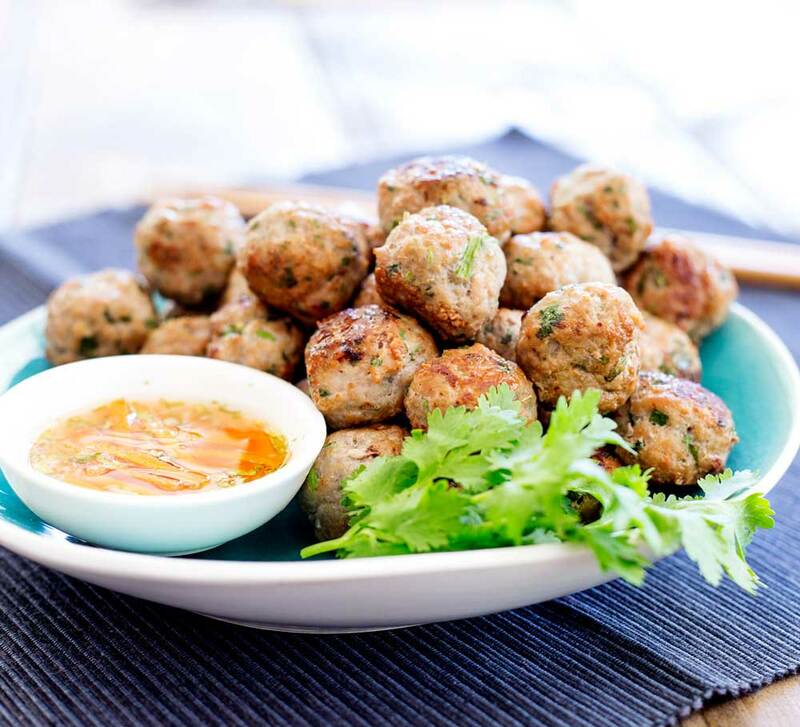 These Thai Pork Meatballs are flavour bombs! Fabulous thai flavours in easy to eat form! Serve these as a canapé, nibble or appetiser. Or cook them up as part of a Thai banquet. However you make them, make sure you grab a few for yourself as these go quickly. 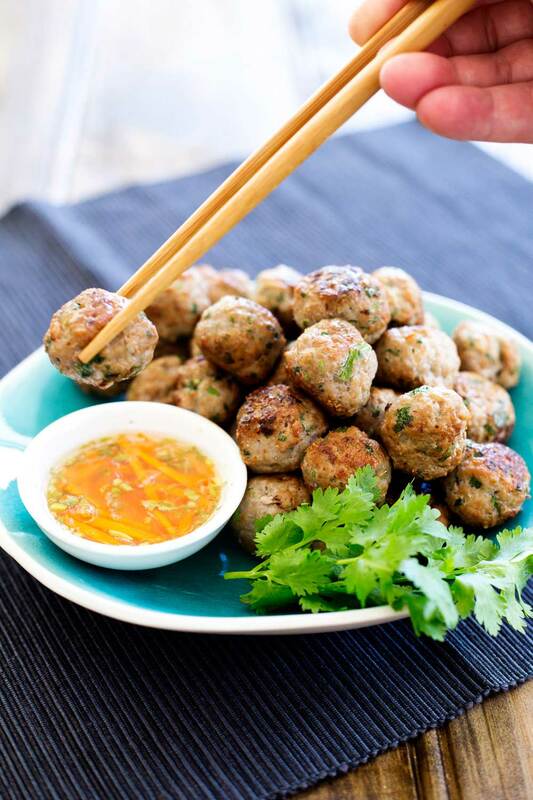 My Thai Spiced Mini Chicken Meatballs are one of the most popular recipes on my blog. Which doesn’t surprise me as they are so delicious!!!! Plus they are gluten free and paleo friendly!!! They are something I always make for parties as they are so quickly demolished! 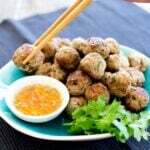 However they do have some chilli in them, so today I am sharing a non-spicy thai meatball. Which is a little ironic as they only person I know who doesn’t eat chilli, is also a vegetarian so these are no good for her either!! But they are perfect for children. They are really packed with flavour and I find kids (Well certainly mine) love strong flavours! Tapenade, vegemite, salt and vinegar chips, green olives, brie, chorizo. They are lovers of them all. So these meatballs are perfect for them. Although there is no chilli, these are still packed with plenty of other wonderful aromatic ingredients! Spring onion, garlic and lemongrass. SO GOOD! You will need a food processor as the lemongrass needs to be pureed, otherwise it is like eating tiny pieces of wood! Well not quite, but it isn’t pleasant. A normal food processor does the job, you don’t need a super duper high powered one. I have a 100 buck one and it works perfectly for this. Just add in all the flavourings and create an aromatic mush! I seriously need a better word than mush!!! Something that sound elegant like mirepoix. I wonder what the french for mush is!!! Just a heads up that the fish sauce means you don’t need to add any salt. I add the fish sauce into the food processor whilst I am making my aromatic ‘mush’. It helps to get the mush going and ensures the fish sauce is really incorporated. I often serve them with the dipping sauce below, but they are equally good with some sweet chilli sauce or a simple soy and rice vinegar mix. p.s don’t leave out the mint, it totally makes this dish! 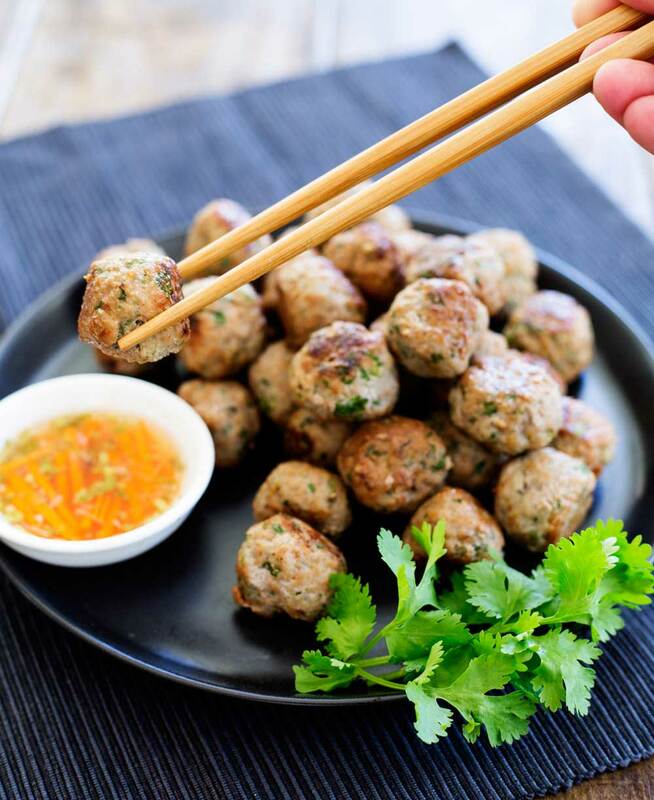 If you love this recipe for Thai Pork Meatballs why not subscribe to my newsletter, then you can have delicious recipes straight into your inbox. 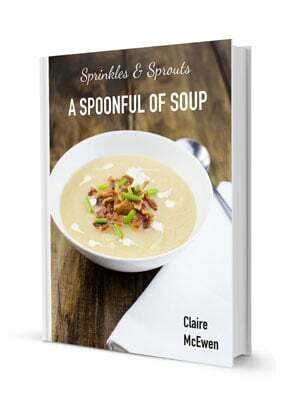 What is more, as a thank you I will send you my soup ebook for FREE! Start by making the dipping sauce. Add the carrots to a small pan along with the remaining dipping sauce ingredients. Place the pan over a low heat and heat gently until the sugar has dissolved. Remove the outer leaves from the lemongrass and cut it into rough chunks. Place it in the food processor and give it a good blitz. Peel the garlic and add it to the processor. Cut the roots and very tough green part from the spring onion and place it in the food processor. Add in the honey and fish sauce, then blitz on high until you have a thick mush. Add the coriander, mint and mince and pulse chop until well combined. Form the balls into 2cm (1inch) diameter balls. 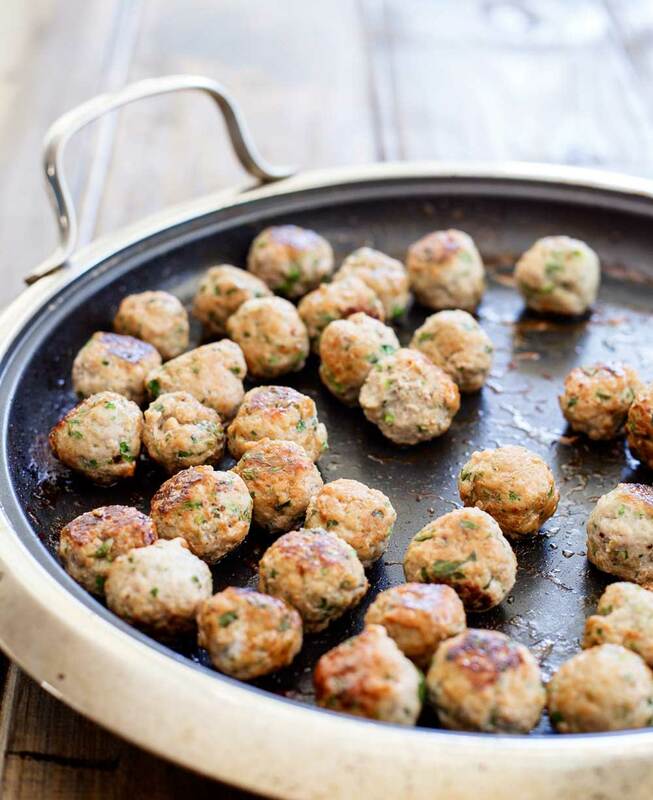 Add a small amount of oil to a non-stick frying pan and cook the meatballs for 4-5 minutes, turning regularly until browned all over and cooked through. 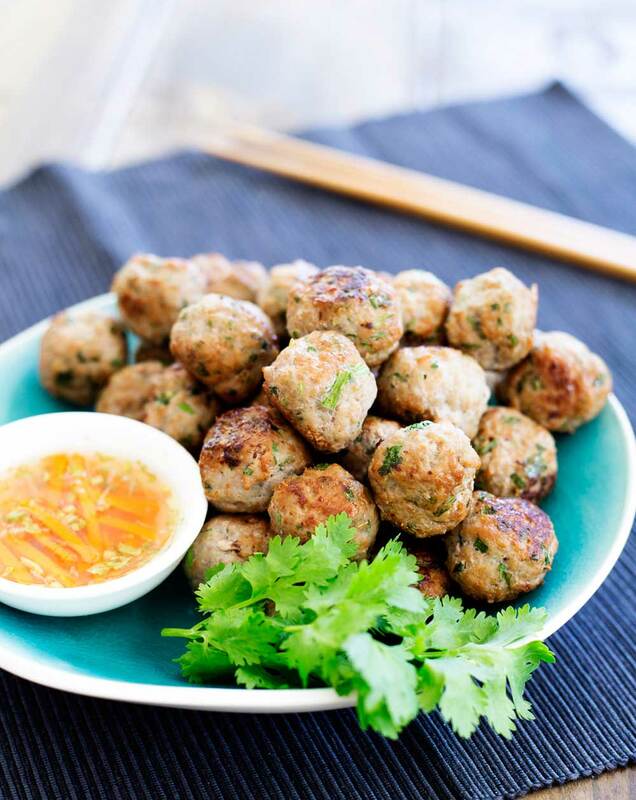 You could replace both the fresh coriander and fresh mint for a small amount of thai basil. Or just leave them both out, they won’t have quite the same freshness, but the flavor will still be yummy.